Gallarus Oratory (Séipéilín Ghallarais) - office23s jimdo page! "The most perfectly preserved of the boat-shaped oratories in County Kerry. It has a flat-headed doorway, inside which are stones from which a door or curtain hung, and a small round-headed east window. In shape it resembles an upturned boat, and all its walls slope inwards towards the top. 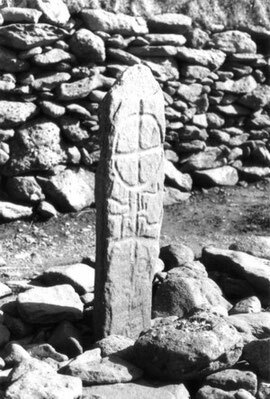 Nearby is a stone-inscribed cross." We visited the Gallarus Oratory (Séipéilín Ghallarais) after a 'trek/pilgrimage' by "Way of the Saints" to the summit of holy Brandon Mountain. A wonderous monument that has withstood the centuries of battering by Atlantic gales, succesive invasions by Vikings, Normans and Englishmen only to find itself emasculated under the feet of tourists. The area is sanitised with neatly clipped lawns and well tended gravel paths, a car park big enough for a coach or three and an obtrusive visitor centre that dominates this sorrowful relic; a 'disneyfication' of heritage. A small dry stone building the Gallarus Oratory is believed to be an early Christian church built sometime between the 6th century and 9th century, although some believe it could have been built as late as the 12th century because the east window has a rounded top made of two carved stones (not a true arch). The building is rectangular and is approximately 8 metres long by 5 metres wide and 5 metres high. In the west gable is a square-headed doorway nearly 2 metres high. According to local legend, if a person climbs out of the oratory through the window their sins will be absolved and their soul cleansed. The Gallarus oratory is built without mortar of the local Gritstone and uses a corbel vaulting technique developed by neolithic tomb-makers. 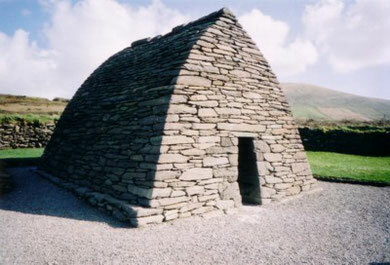 A technique in which the stones are laid at a slight angle, lower on the outside than on the inside allowing rainwater to run off and so keeping the interior relativly dry. Shaped like a boat, this minature church overlooks Smerwick Harbour (Ard na Caithne), this shape and location put in mind the miraculous voyage of Saint Brandon and the mountain I climbed in the mist earlier that day. Would leap up to his God off this floor. Under the black weight of their own breathing. The sea a censer and the grass a flame. "(Inside, in the dark of the stone,)I felt the weight of Christianity in all its rebuking aspects, its calls to self-denial and self-abnegation, its humbling of the proud flesh and insolent spirit. But coming out of the cold heart of the stone, into the sunlight and the dazzle of grass and sea, I felt a lift in my heart, a surge towards happiness that must have been experienced over and over again by those monks as they crossed that same threshold centuries ago. This surge toward praise, this sudden apprehension of the world as light, as illumination, this is what remains central to our first nature poetry and makes it a unique inheritance." - Seamus Heaney. Preoccupations: Selected Prose 1958-1978. London: Faber, 1980.